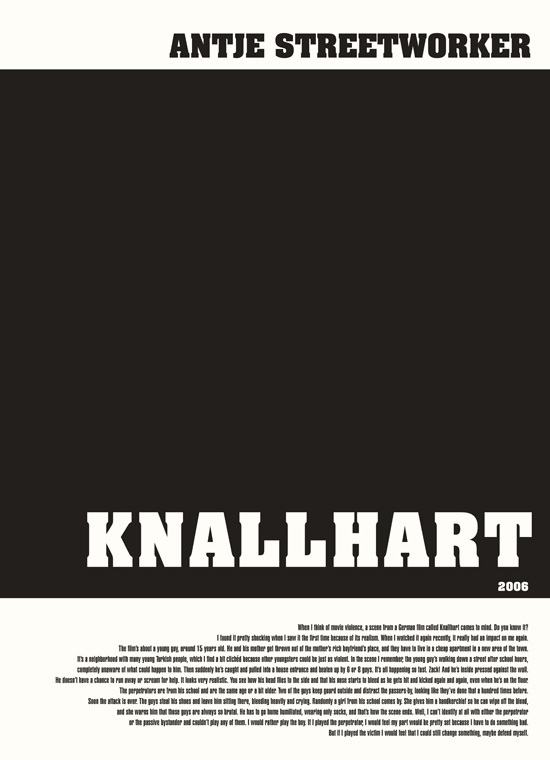 When I think of movie violence, a scene from a German film called Knallhart comes to mind. Do you know it? I found it pretty shocking when I saw it the first time because of its realism. When I watched it again recently, it really had an impact on me again. The film’s about a young guy, around 15 years old. He and his mother get thrown out of the mother’s rich boyfriend’s place, and they have to live in a cheap apartment in a new area of the town. It’s a neighborhood with many young Turkish people, which I find a bit clichéd because other youngsters could be just as violent. In the scene I remember, the young guy’s walking down a street after school hours, completely unaware of what could happen to him. Then suddenly he’s caught and pulled into a house entrance and beaten up by 6 or 8 guys. It’s all happening so fast. Zack! And he’s inside pressed against the wall. He doesn’t have a chance to run away or scream for help. It looks very realistic. You see how his head flies to the side and that his nose starts to bleed as he gets hit and kicked again and again, even when he’s on the floor. The perpetrators are from his school and are the same age or a bit older. Two of the guys keep guard outside and distract the passers-by, looking like they’ve done that a hundred times before. Soon the attack is over. The guys steal his shoes and leave him sitting there, bleeding heavily and crying. Randomly a girl from his school comes by. She gives him a handkerchief so he can wipe off the blood, and she warns him that those guys are always so brutal. He has to go home humiliated, wearing only socks, and that’s how the scene ends. Well, I can’t identify at all with either the perpetrator or the passive bystander and couldn’t play any of them. I would rather play the boy. If I played the perpetrator, I would feel my part would be pretty set because I have to do something bad. But if I played the victim I would feel that I could still change something, maybe defend myself. These ‘statements on violence’ can be read in the Direct Approach Guidebook.